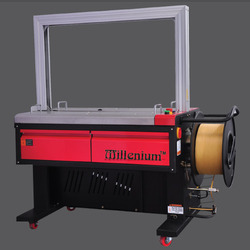 We are offering our clients Power Roller Fully Automatic Strapping Machines. 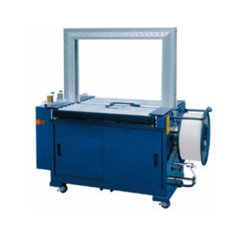 These machines are designed and fabricated with the aid of cutting-edge technology and machinery. These machines work with high efficiency and little energy consumption. Moreover, these have a strong and corrosion resistant body, which makes these highly durable. Makes the Machine reliable as compared to other Machines available in the Market using contactors & relays. Results into better longevity, lesser breakdowns and increased productivity. Modularly designed Aluminum alloy arch, easy to assemble and disassemble, Change size economical, No Arch motor required. Auto strap positioning and retry feeding functions ; to ensure that the strap reaches its proper position and every cycle is accurate and efficient. Convenient operating modes with panel, ball switch and foot pedal switch. By rotation of mechanical tension knob user can easily set required tension. Control Voltage of 24 V(DC) ensures the safe operation and prevents operators from electrical shock. The Power Belt Automatic Strapping Machine is designed with different innovative designs.Its is design for light weighting having heavy mobility. This machine is fitted with a concise, low maintenance sealer head. Simply place your item on a strapping on the table, feed the strap around the item and into the strapping head, which hits a trigger. 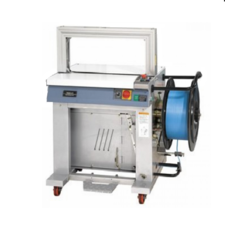 Strapping machines dispenses, tightens and seals straps (PP or PET) while packing or bundles. Power Belt Fully Automatic Strapping Machine is ideal for cartons, calcium-plastic cases, books, soft and hard packages as well as all kinds of articles in square, cylinder or annulations. A semiautomatic strapping machine is simple for anyone to use and straps at a quick speed with high efficiency. Simply place your item for strapping onto the table, feed the strap around the item and into the strapping head, which hits a trigger, pulls the strap back in reverse, tensions, and heat seals then cuts the strap. 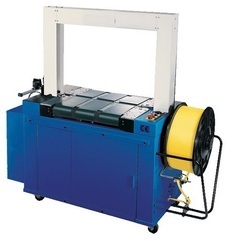 Looking for Automatic Strapping Machines ?